Disney and Lucasfilm have released details of a new Star Wars initiative, celebrating the stories of the heroes from across the iconic Star Wars universe. Called Star Wars Forces of Destiny, the initiative will feature an original series of animated shorts, each exploring new adventures of key characters including Rey, Jyn Erso, Sabine Wren, Princess Leia, Ahsoka Tano and more. The animations will launch ahead of a collection of published titles and a TV special later in the year. The new stories will also be supported by a line of toys from Hasbro, including new Adventure Figures; delivering a fusion between traditional dolls and action figures. Each individually designed figure will feature dynamic action along with multiple points of articulation to help recreate the character’s adventures and heroic moments. This will be rounded out with global product extensions, including books, apparel, bedding and toys. 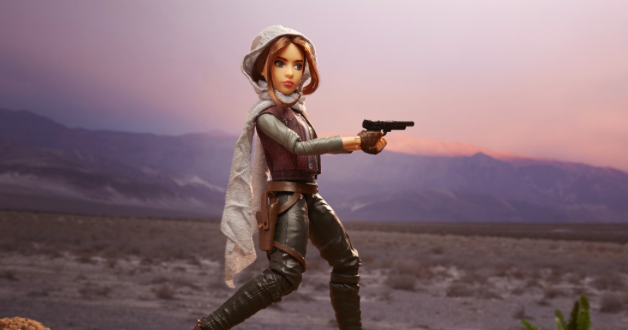 “Star Wars Forces of Destiny is for anyone who has been inspired by Leia’s heroism, Rey’s courage or Ahsoka’s tenacity,” said Kathleen Kennedy, president of Lucasfilm. Developed by Lucasfilm Animation, Star Wars Forces of Destiny will remain true to the Star Wars canon and launching in July, the animated micro-series will be available on Disney YouTube ahead of a two-part TV special, featuring eight additional shorts on Disney Channel in autumn this year. Jimmy Pitaro, chairman, Disney Consumer Products and Interactive Media, added: “From Princess Leia to Sabine Wren, Star Wars heroines are unique and we wanted to represent that in the product line for Star Wars Forces of Destiny. The 11-inch figures will depict characters including Rey, Jyn Erso, Princess Leia, Sabine Wren and an iconic cast of sidekicks and villains such as BB-8, Chewbacca, Kylo Ren and more. Hasbro is also rolling out Star Wars Forces of Destiny role play and accessories. John Frascotti, president of Hasbro, concluded: “As the Star Wars fan base has broadened over the last 40 years, we have continued to add new and exciting play experiences to the Star Wars brand, to engage fans across generations.